Ethiopia the land of Queen of Sheba, it was left bankrupt by years of civil war, drought, floods, famine, and disease have pushed many over 5 millions of Ethiopian children are today motherless because their parents are either no longer living or are unable to care for them. A number of U.S.-based adoption agencies have been authorized by the Government of Ethiopia to provide adoption services, and several others pending accreditation. The government office responsible for adoptions in Ethiopia is the Adoption Team in the Children and Youth Affairs Office (CYAO), which is under the Ministry of Women’s Affairs (MOWA). Symbolically the fostering families are required to submit post-placement reports until the child turns 18, very few are respecting them once the got the child. Adoption from Ethiopia is open to any body while a country like thiland are banning due to chile abuse. Adoptions to both the U.S. and Canada have increased notably. In the U.S. the numbers were 1,725 in 2008, vs. 1,255 in 2007. 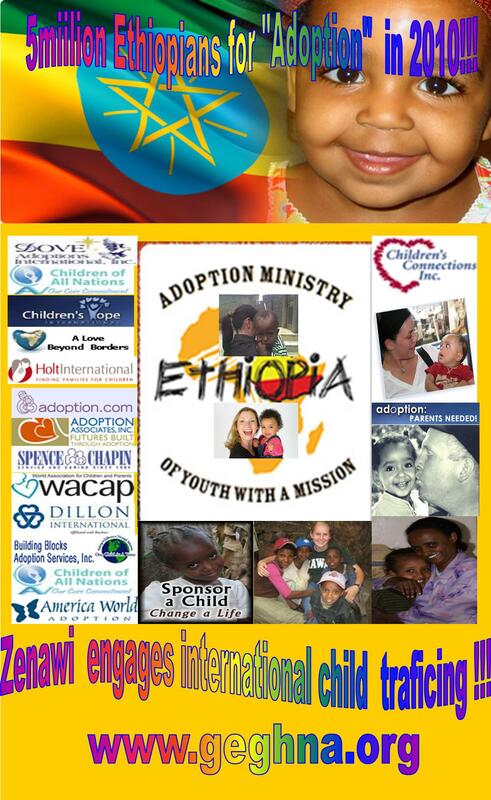 Today the adoptions and foster service providers in Ethiopia has greatly increased. Fews agencies comprehend the existing laws and inconsistent policies among various agencies has caused confusion leading to unprecedented corruption leading to child trafficking. Today many foster familes are complaing the price an Ethiopian child high in the market . A organizations are set to help these familes to cover the offical price . The worst is the corrupted officals and middle men who makes on every child. Many kids are there on the under ground child traficing markets . Some are even sold in black market for body part trafficking . Apart from abandoned children, there is also a steady increase in the number of Ethiopian children becoming orphans because of Aids. There are nearly 40 agencies in Addis Ababa handling adoptions. In 2008, U.S. citizens adopted approximately 1,725 children from Ethiopia. Children of all ages are available for adoption including infants, sibling groups, multiples (twins and even triplets), older and special needs children, both boys and girls. These children reside in orphanages. Children six months to 14 years of age. Both boys and girls are available for adoption. First time parents should be flexible in regards to gender selection. Children are generally healthy, but may have parasites and other treatable conditions caused due to living conditions. Children are tested – at minimum — for HIV/AIDS, and Hepatitis and several other conditions. Special needs children are available. Many older sibling groups are available. Most of the parents are from abroad. The adoption of Ethiopian children by foreigners has increased sharply in the past few years, with thousands of parents from various parts of the Western world adopting children from this impoverished country. Kids Care Orphanage is just one of the numerous orphanages and child care centres in the Ethiopian capital. Mostly abandoned children and mutilated child bodies are found in the dark alleys of the African capital . You will be surprised at times even in toilets a cry of a motherless child. Some are licensed by the Ethiopian authorities, who claim Ethiopian orphans have a right to be adopted, but they practiced daily sending hundreds abroad knowing it must be a last resort since it is preferable for child to be brought up in their own culture. There are many who are engaged in child traficing and body marketing too. Very few are orphans who merit a well publicized adoptions, movie star Angelina Jolie adopted an Ethiopian child with the help of a well known agency ” Wide Horizons for Children”. Today many local agencies are are highly corrupted working cladestaily with child traficaing mafias as a million dollar business. Officially the process of adopting children from Ethiopia is much simpler than many other country today due to this wicked corruption. In one of the most well-publicised adoptions, movie star Angelina Jolie adopted an Ethiopian child with the help of an agency called Wide Horizons for Children. The adoptive parents are asked come personally and collect the child. This the moment they will go to a lot of unprecedented corruption methods and red tapes. The government has put it mandatory the foster the parents to stay at least two weeks in Ethiopia to study the culture. They will in the contrary have the necessary time to learn something about Ethiopia’s corrupted adoption and child trafficking system. 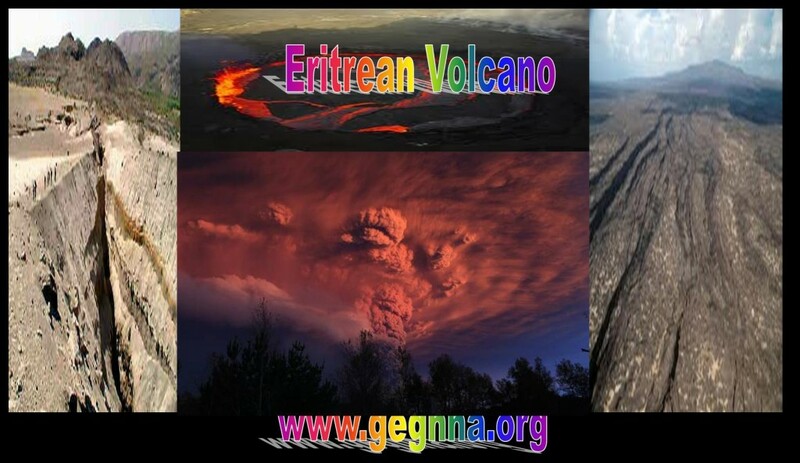 Adoption in Ethiopia has not been without international controversy. It has been well described as being a center of child trafficking and body marketing flown out directely to the international Kideny and other body banks. It is a million dollar business. Many preferred silence not to be a spot light on media and loss a lot of dollars fro the extradition of the motherless child. Our investigation as proved that most of the adopted one have one or two of their parents. The true orphans are lingushing in the orphanage waiting for adoption if they do not fail in the hands of body or child trafficking mafias those with connection or some relatives in Europe or America end up to be adopted as orphans. (CBS) Videotapes showing poor orphans from third world countries melt the hearts of prospective parents every day in this country. Three children, sisters from Ethiopia are shown in a video – ages, you are told, 7, 4 and 6. Their mother is dead, their father dying of AIDS. A life of prostitution is all but assured – if not adopted – saved – by a loving American family. It was just such a pitch that spoke to Katie and Calvin Bradshaw, reports CBS News chief investigative correspondent Armen Keteyian. They adopted all three girls through a U.S. agency, Christian World Adoption. “Aside from the gender of the children, everything else proved to be a complete lie,” said Katie. In truth, the three sisters, Journee, Maree and Meya – were actually much older: 13, 6 and 11. While their mother was dead, their father was healthy and very much alive. He was living, by local standards, a middle-class life – an extended family able to take care of the girls as middle sister Meya showed us first hand. “My godmothers, my aunt, those are my mom’s friends, my uncles, my dad, my dad’s friends, that’s my brother,” she said. In the last year adoptions from Ethiopia to the U.S. have skyrocketed – growing faster than any other country in the world. They have risen from 731 in 2006 to more than 2,200 last year. That’s nearly six children per day. Now a CBS News investigation has discovered that growth has turned Ethiopia into fertile ground for child trafficking – a country in which some American agencies and their staff engage in highly questionable conduct. Adoptive families allege that many children brought to the U.S. are not even orphans, that prospective parents are misled about a child’s health and background, that local families are recruited – and sometimes even paid – to give up their kids. Which the Bradshaw sisters say is exactly what happened to them. “Your dad was paid,” Keteyian asked Meya. “From Christian World Adoption,” Keteyian asked. 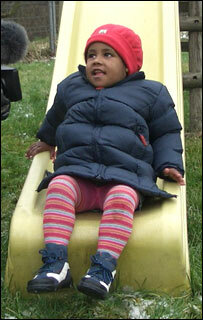 Christian World Adoption is one of 70 agencies licensed to operate in Ethiopia. Beyond the alleged payment to their father, the Bradshaw sisters say they were told by local employees of Christian World they were only coming to America for an education; that they could return home when school was out. Not true. In fact it’s virtually impossible to reverse an adoption in Ethiopia. “We have watched our kids grieve and cry and scream and melt down from the bottom of their souls over the loss of their country and their family,” Katie Bradshaw said. A 2007 video shows Christian World representatives entering an Ethopian village and appearing to recruit children from poor villagers – an unethical practice against Ethopian law. “If you want your child to be adopted by a family in America you may stay,” said Michelle Gardner. She spoke those words on a tape produced by Christian World for American parents seeking to adopt in Ethiopia. And now says she deeply regrets it. Christian World was founded back in 1991 by Bob and Tomilee Harding. In 2008, records show, the non-profit agency took in nearly $6 million dollars – charging a fee of about $15,000 per child. Citing ongoing litigation, the Hardings declined to speak with CBS News at their offices in Charleston, South Carolina. “How do you respond to charges that CWA knowingly deceived or misled adoptive parents through the adoption process in Ethopia?” Keteyian asked. “Those allegations are completely unfounded,” said Curtis Bostic, attorney for CWA. He told CBS News he was prohibited by law from discussing specific adoption cases. The Bradshaw family lives with its own set of regrets. Parents who trusted and believed they were doing the right thing. The three young girls are learning to adopt a life far from the country they still call home. This year’s Africa Day celebration in Parliament was themed “Building and Maintaining Peace through Sport in Africa”. Parliament must be commended for hosting the important event, which took place just a few days before the kick-off of the biggest sporting event on the planet – the World Cup. Football has for ages served as a uniting sport for people of all races throughout the world. It has brought hope during extreme difficulty; unity where there was division; courage in the face of systematic injustice; faith in what looked impossible; and victory over subjugation. Given the continent’s history of conflict and instability, the World Cup must foster peace in Africa, and should be used to usher in a new era of unity and stability in the continent. We are confident that this prestigious world event will not only leave a lasting legacy for South Africans, but for the continent as a whole. It is for this reason that we have called this event an “African World Cup”. This year’s marking of this important day on the calendar of the African continent takes place two years after violent attacks targeted mainly at foreign nationals in communities in Gauteng and other parts of the country. While those attacks were generally xenophobic in nature, they also bore some ethnic undertones as they were also targeted at South Africans. The ANC and government moved swiftly to decisively quell the attacks and ensured that those behind the attacks were isolated by society and arrested. As we celebrate this important day, we must as a nation and continent continue to consolidate our social stability and reaffirm our efforts to build a human rights culture. We must, through words and deeds, shun such ugly and repulsive acts both within our borders and elsewhere on the continent. On Africa Day we must reaffirm our solidarity with the rest of the continent. We will continue to empower our people to become their own liberators from poverty and underdevelopment. The establishment of the AU and the adoption of the New Partnership for Africa’s Development (Nepad) were confirmation that Africa was focusing on developmental issues to create a better life for all. While Africa continues to record successes on many fronts, we are also mindful of the many challenges still faced by the continent. Extreme poverty characterised by the lack of access to basic education, health care and adequate nutrition remain some of the main challenges facing the continent. The spread of diseases, especially HIV/Aids, continues to threaten Africa’s efforts to attain peace, stability and prosperity. Parliament must use the Africa Day celebration to acknowledge the continent’s achievements and to take stock of challenges it still faces. It is important to use that opportunity to reflect on the roots of the renascent ideology and its future. We must use the celebration to recall that the founders of African nations were spiritual and religious people, guided by the desire to create non-racial, non-sexual, united and democratic and prosperous societies in which the value of all citizens was measured by their shared humanity. Africa is a great continent that gave birth to human civilisation. It gave birth to sciences and philosophy which shaped modern sciences and society. More specifically, Africa gave birth to humanity itself – sciences such as geometry, astronomy, astrology and mathematics. Africa also gave birth to spiritual philosophy of humanism (Ubuntu/Botho) which gave the modern world a universal value system that took root during the European Renaissance, which was inspired by the recovery of Khemeti. It is therefore not surprising that the founders of modern African nations appealed to the glory of ancient Ethiopia and Africa to propagate their (notion of) equality of Africans to other races. The African Renaissance is an ideal that came from the people and must be rooted among the people to succeed. To understand it we must remember that Africa was ravaged by the slave trade and colonialism. These two inhumane systems virtually killed Africa. For us to understand and nurture the renascent movement we need to understand its underlying ideas and motives. African people were not only uprooted from their continent and enslaved abroad, they were denied their humanity and treated as second-class citizens in state and church, including cultural institutions. Africans remember their disposition to associate with one another for mutual benefit. In the Americas, three types of organisations were established as a result of this disposition. These organisations were the Prince Hall or African Masonic Lodges, and Ethiopianism that included Sylvester Henry Williams, founder of Pan Africanism, Booker T Washington founder of the Tuksgee Institute and mentor of John Langalibalele Dube – the founding president of the ANC. The others were WEB du Bois and Marcus Garvey as well Richard Allen, founder of the African Methodist Episcopal (AME) Church. The father of African Ethiopian Theology, Reverend Mangena Mokone, founded the Ethiopian Church of South Africa, which became the 14th district of the AME. The AME was established in 1892. In the same year Dube foretold the rebirth of Africa in his public lecture entitled Upon my Native Land. In that lecture he foretold a rebirth of a spiritual, humane and prosperous South Africa. The affiliation of the Ethiopian Church to the AME was concluded in 1896. From that year onwards many African students were offered bursaries to study in African/American colleges, where they were profoundly influenced by Masonic teachings of Prince Hall, Ethiopianism and Pan Africanism. In 1898 Bishop Turner of the AME Church came to South Africa and ordained many priests in the Ethiopian Church. The Pan African Movement took shape in 1900 when Williams convened the First Pan African Conference at which Du Bois delivered a keynote address. In that address Du Bois foretold that the colour line would be the greatest problem of the 20th century. The conference also condemned the atrocities perpetrated on African people during the Anglo-Boer war. After the conference some delegates, including Williams, came to the Cape where they joined Bishop Copplin of the AME Church and other AME officials who propagated both Ethiopianism and Masonic teachings. Ironically, the Pan Africanists used Masonic teachings and Ethiopian theology to promote universal brotherhood and sisterhood while Cecil John Rhodes and his followers used Masonic teachings to justify the suppression and exploitation of African and other races. It was this racially discriminatory ideology that inspired the Boers and Britons to conclude the Treaty of Vereeniging which reconciled Boers and Britons on the basis of social exclusion of African people. Mathole Motshekga, Chief Whip of the ANC, speaking at the Africa Day celebration in Parliament yesterday.